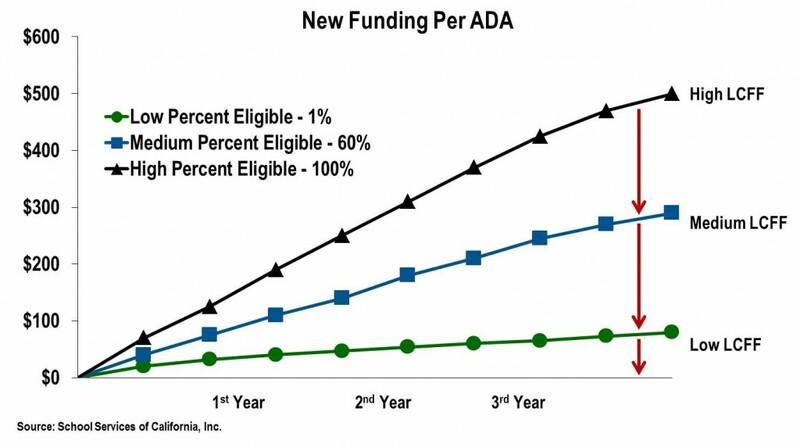 Much attention has been paid to the calculation of revenues and redistribution of funding that occurs as a result of California’s new Local Control Funding Formula. We see the dust settling on that issue and the calculations becoming more routine as they become better understood. But we see a lag in the adoption of new thinking that must accompany implementation of the new formula. Below are just a few of the many areas where we think a refocused approach will be necessary. The governor has clearly made the case that the failure of our generation to close the ever-widening gap between the achievement of our highest and lowest performing students harms our society, hampers our economic growth and stifles the American Dream for a significant portion of our population. The governor has also clearly stated that long-term prospects for our state and nation are clearly affected by the manner by which we address this problem and the priority we afford it. We agree with that premise, and the evidence is clear that after 40 years of revenue limits and categorical programs the gap has widened, not closed. But we need to recognize that the funding system was not the only variable during that long period of time. A series of events including court decisions, legislative priorities and initiatives like Proposition 13 and Proposition 98 helped to shape our per-student spending—once among the highest in the nation—to consistently being near the very bottom of the ranks. At the same time that funding was falling, the needs of our changing demographics were evolving as well. Higher numbers of poor families and non-English-proficient students increased the demands on our education system just as funding was falling. The result was predictable. California’s ranking among the states in student achievement has fallen in line with the drop in funding. By most measures, we now rank in the bottom five states in both per-student funding and student achievement. There are a few bright spots in the statistics, but not nearly enough. Our system produces a broad range of student outcomes; we have some of the top performing students in the country, but the average also reflects the very large number of low-performing students that our system also serves. We agree with the governor that closing the achievement gap should be a very high priority for the state and for the nation. The Local Control Funding Formula is a distribution mechanism, not a source of new funding; if we remain nearly last in the nation in per-student funding, we are not likely to see the hoped for results. We need to change both the distribution of funding and the level of funding to have any chance of regaining our competitive position vis-à-vis the higher-performing states. During our many years of working with boards of education in California, we have heard one consistent complaint: “If the state would just let us control the dollars, we could do more with them and achieve better results for our students.” And for the past 40 years that complaint has been valid, particularly in the area of categorical programs. The base revenue limit has provided a minimal amount of funding, nearly all of which goes to basic staffing and operation of schools. A diverse menu of programs for students with a wide variety of unique needs has been provided by an ever-changing list of categorical programs. Categorical programs bring additional money to the school district, but they come with very significant restrictions. Each individual program defined which students could be served, how much money per student was provided, the rules for expenditure of the funds, audit and compliance requirements, and penalties for noncompliance. As a result, superintendents and boards of education often complained that they were simply administering the state’s programs, not really affecting education policy. In 2008-09 things started to change. Accompanying a substantial 19.84% funding reduction to 42 categorical programs, the state gave local districts full flexibility in using the remaining 80% of the money. True, this was done during a time of crisis to help districts deal with major funding cuts, but the results of the additional flexibility were instructive in the creation of the LCFF. The governor answered that question loudly for 2013-14 by eliminating 40 categorical programs, removing them entirely from the statutes, and providing the funding directly to local school agencies. As a result of implementation of the new funding formula, local governance teams — mainly the board and superintendent — are given new opportunities, but only if they seize them. 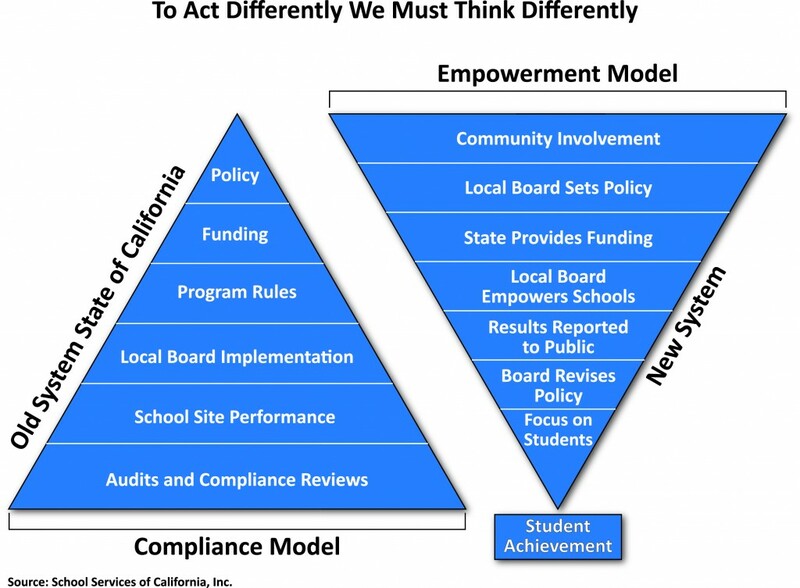 Moving from a top-down, rules-driven system toward a system with substantially more local control of resources and greater responsibility for student outcomes requires different thinking at the top. Questions like “What are we required to do by the state?” are replaced with more fundamental questions like “What do our students need in order to improve?” Expectations of the state are replaced by expectations of the community. Those expectations are to be captured in a rigorously developed Local Control and Accountability Plan (LCAP). Under the new law, the local accountability plan must precede adoption of the district budget and the budget must be consistent with the accountability plan. Both the budget and the accountability plan are to be reviewed and approved by county offices of education and then posted on both the district and county office websites to provide full access to the public. We have suggested that the decision making structure at the local level has been turned upside down. The compliance model is replaced by a local empowerment model. The illustration below helps to highlight that change. We think our illustration helps local leaders to clearly see the differences between past expectations and future opportunities. But we are all creatures of habit, and many education leaders are waiting for the state to tell them what to do. We do not think the process is enhanced by asking the state for tight direction on the new system. In fact, we think local districts have the information and authority to begin the transition without further direction from the state. The State Board of Education is charged with developing regulations that are consistent with the new funding system and publishing those regulations in the spring of 2014. But the major requirements of the law are known now and we think local districts should be moving forward now. The law specifies eight elements that each district must address in its LCAP. None of these are new areas for experienced educators; we already know, in the main, what we will need to include in the plan in order to address each of the areas. Remember, the plan must be adopted prior to the adoption of the district budget in June of 2014. Districts that wait for more guidance from the state will find themselves doing very high-skill work on a very short timeline. We think districts should start development of their local accountability plans now. One last subtlety in the process: The district superintendent is initially charged with “consultation” with a wide variety of stakeholders including employees, employee unions and even pupils. Consultation implies discussions before decisions are made. Once those consultations are completed, the superintendent is charged with bringing forth a plan for “review” by parent and other constituent groups specified in the law. At that point, the superintendent must have a draft plan in hand and must respond to comments in writing. Ultimately there will be a public hearing prior to adoption of the accountability plan by the local board of education. There are quite a number of prescribed meetings, with groups that may still need to be formed, and districts that get participants identified and meetings calendared now will be way ahead of the game. In the words of one of our directors, Jeff Bell, a former naval officer, “when you find yourself in command, take command!” Those words have never been more appropriate. Earlier we addressed the need to add substantial funding, as well as to change the distribution system. The governor’s plan is to add that funding over an eight-year period beginning now and ending in 2021. We have no expectation that we will enjoy eight straight years of economic prosperity and stable state economics. We expect some bumps in the road, the kind that our cyclical economy has always produced. The new funding formula provides differentiated increases in funding to school districts that vary in 2013-14 from a low of less than 1% to a high of nearly 9%. That is very wide variability for a one-year increase. But whatever amount a district receives is ongoing money, and the districts that get the higher amounts in the first year continue to increase at a similar rate over the eight-year period. The compounded result after just the first three years would show a projection of nearly a 30% increase for some districts and very marginal increases for others. Our purpose is not to reopen discussions of where differences that great are warranted; that decision has been made. Our point is that when the state hits that first economic snag, which will surely come, some districts will be hit much harder than others and they need to prepare for it. The chart below illustrates what we see as the variability in risk. As can be seen from the chart above, a district planning for very high ongoing increases has a lot more to lose than a district planning for a very low increase. We think there are at least two areas in which a district should plan to protect against this volatility: reserve levels and planning for a range of revenues. Currently, school districts are required to maintain financial reserve levels in accordance with criteria and standards promulgated by the State Board of Education. Presently those reserve levels are determined solely by district size, with most districts maintaining a 3% reserve for economic uncertainties (roughly equivalent to only six days of payroll). We think the State Board needs to rethink the criteria for reserve levels for all districts, given the differences in volatility of future revenues. In the meantime, we have recommended that districts establish a separate reserve, over and above the reserve for economic uncertainties, equal to one year of expected growth in the LCFF funding for that district. That would have the effect of giving the district a year to make budget adjustments if the economy turns downward and the state again reduces funding for schools. We have also developed a range of planning factors for our clients related to estimates of future revenues, expenditures and reserves that are unique to each district. The highest level of revenue funding would be achieved if the state stays on or above its planned path toward full implementation in 2021. But in the event that the state experiences adverse circumstances, we also offer a lower planning factor for revenues that provides a margin of safety. In our model, we update the numbers and projections for each district as the state updates its own budget. We think the combination of planning for a range of options and maintaining higher reserves are policies that will serve school districts well over time. The Local Control Funding Formula is being trumpeted as a major component of future student success. We think it is important, but not the most important component. Over past decades our professional educators in public schools have labored with a heavier burden than in other states. Our class sizes are the highest in the nation and our per-student spending nearly the lowest at 49th according to the latest NEA reports. Our ratios of classified employees, administrators, librarians, nurses and counselors are also at the bottom of national rankings. Our strength is our people, our weakness has been our lack of resources. As we look to the future, we believe that fixing systems can remove barriers to success for our students. But we also believe that the most important factors in the success of our students will continue to be passionate local leadership, the quality of our professional teachers and other staff members, and frankly money. Robert Miyashiro and John Gray contributed to this analysis. This analysis was prepared especially for EdSource readers by School Services of California, Inc., which has been advising K-12 education agencies and community colleges on business and financial issues for the past 39 years. 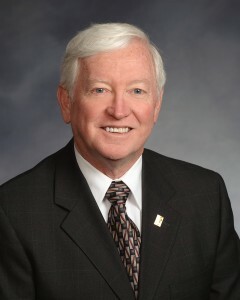 Ron Bennett is president and CEO of School Services of California, Inc., a Sacramento-based company that provides business, financial, management and advocacy services for school districts. He has been the Chief Business Official for Long Beach Unified School District, Fresno Unified School District and ABC Unified School District. Our district is in LCFF paralysis right now, fearing that they might spend the money in ways that will violate future State Board of Education guidelines. Our Board of Ed recently awarded a raise to teachers; other district employees will likely get a raise soon. If Mr. Bennett’s higher reserves were implemented there is a real danger of raised expectations but lowered resources from 2012-13. Thanks to School Services for taking the time to make a version of this report for EdSource. What most school districts are being asked to do is improve educational outcomes for 2013/14 demographics using 2007/08 dollars with a pent up demand for salary increases. I absolutely agree with Mike; the 2013-14 LCFF funding for most districts is above 2012-13, but still substantially lower than the actual funding the districts received through the base revenue limit and categorical funding in 2007-08. That comparison also ignores the effects of inflation. The Governor’s plan is to be implemented over eight years; first year expectations for funding, program recovery, and student performance are way too high.